Were red phones actually part of Hotlines? U.S. President Reagan Red Phone. 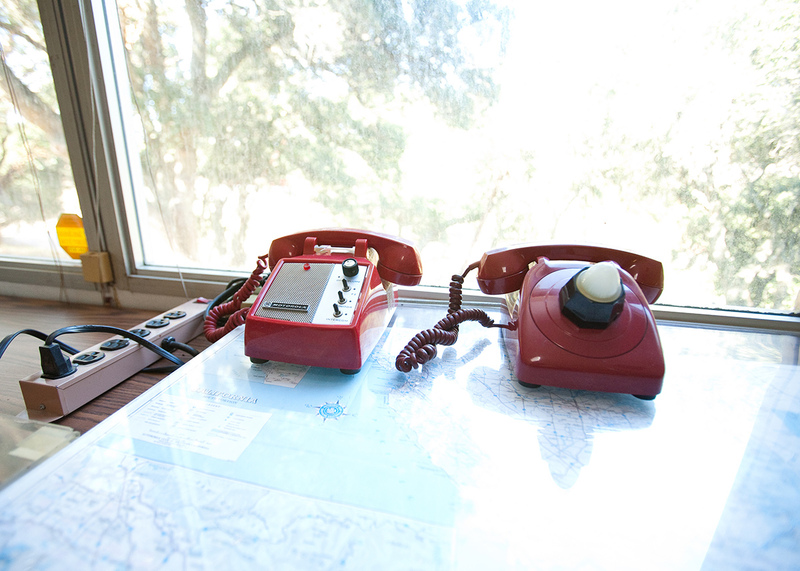 Unusual red phone at the Ronald Reagan's ranch "Rancho del Cielo" in California. I believe that it has "LIFT TO RING", "TURN TO RING" or "PUSH TO RING" written on top of the handset. The website seems credible in terms of an actual visit of the presidential ranch and accompanied by tour staff. Different photos can also be seen at other websites including this one of a visit to the Western White House in 2005. 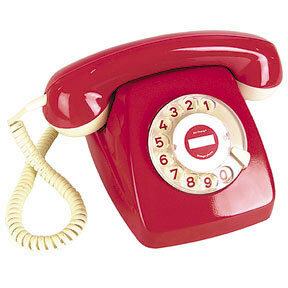 This is another but different photo of this unusual red phone. White House Museum - Oval Office Website. 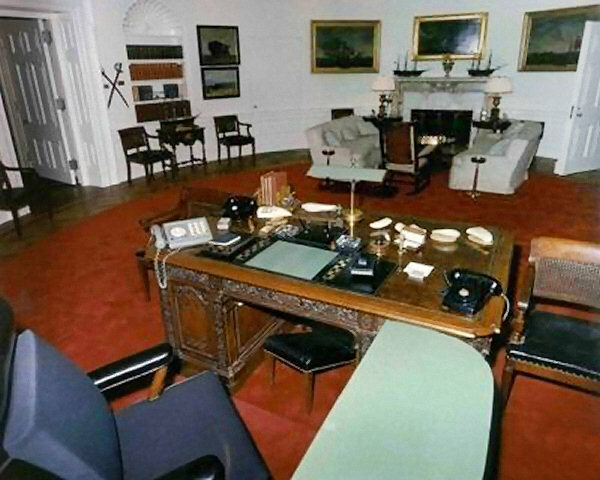 This website offers many photos of the Oval Office and varying decors and phone equipment through time. The link photo on the left shows the Oval Office in 1963 during the Kennedy years with three phones on the desk including one black phone without a dialer. Click here to view in large format. USSR and U.S. Hotline. Jerry Proc's website on the main USSR and American HotLine Link technical specifications from which he concludes that there were no phones (red or otherwise) explicitly part of this link per se until at least the early 1970's as the initial hotline connection was conducted via teletypes with encryption (ETCRRM). Mr. Proc has many web references worth reading at the bottom of his webpage on the Hotline Link. The June 20, 1963 memorandum stipulated the establishment of "one full-time duplex wire telegraph circuit, routed Washington-London-Copenhagen-Stockholm-Helsinki-Moscow" for the transmission of messages. Another duplex radiotelegraph circuit, routed Washington-Tangier-Moscow, was to be used as a reserve link. Identical terminal points were established in the two capitals and services by top-notch communications men and interpreters. The Moscow terminal point, dubbed the Red Phone, was located in a cell under the Kremlin. The Kremlin leader first used his Red Phone in 1967 during the six-day Arab-Israeli war to prevent possible misunderstanding between the naval groups of the Soviet Black Sea Fleet and the US 6th Fleet, which approached each other dangerously closely in the Mediterranean. According to Viktor Sukhodrev, the Kremlin interpreter who had worked with Khrushchev and Brezhnev, at first "there was no telephone; there were only simple teletypes, like at any common telegraph. The Soviet leaders had to wait while their words were translated into English and sent by operators to Washington. The teletypes were replaced with a telephone only in the early 1970s, under Leonid Brezhnev." The rapid technological progress and especially the quickly developing satellite communications and growing amount of information called for modernising the Hot Line. The first stage of modernisation was launched in 1971 and lasted until 1978, when the telephone line was complemented with two satellite communication lines that used US Intelsat communications satellites, poised at a geosynchronous orbit at an altitude of 36,000 km, and the Soviet Molniya II satellites on a highly elliptical orbit. The Washington-Tangier-Moscow radio circuit was terminated. In 1986, the modernised Hot Line consisting of a voice-transmitter and two improved satellite telephone channels became effective at the joint initiative of the Soviet and American administrations. The Soviet Union used the stationary Gorizont-class satellites, created in the late 1970s and registered with the International Electric Communication Union as the Statsionar system. The Russian satellite group working for the Hot Line is controlled from the Vladimir space communications centre set up in 1971. 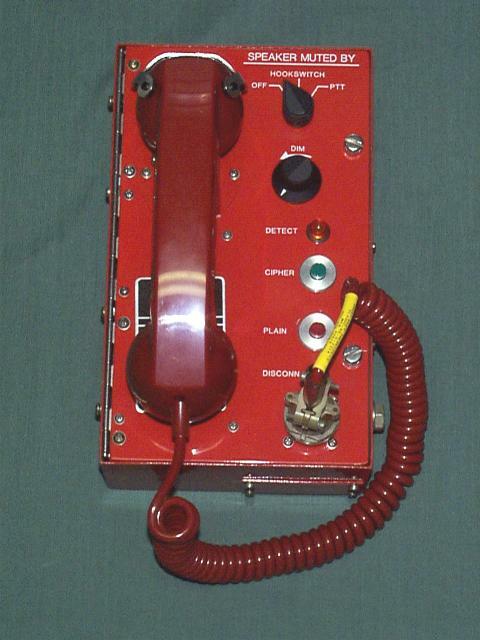 Smithsonian.com article written by Tom Clavin and published 19 June 2013 titled "There Never Was Such a Thing as a Red Phone in the White House". More recent and definite perspective on the question of red phones! Clicking on the photo on the left will take you to the Smithsonian article. "The Atlantic" article written by Rebecca J. Rosen and published on 26 June 2013 titled "Technology Mythology: No Red Phone Ever Connected the White House to Moscow". Article refers largely to the Smithsonian.com article written by John Clavin above. Clicking on the photo on the left will take you to the article from "The Atlantic". 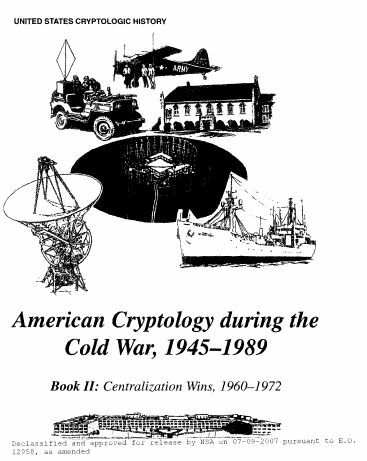 American Cryptology during the Cold War This document which contains declassified portions of the American Cryptologic History during the Cold War has the following entry as part of the USS Pueblo capture by the North Koreans in 1968: "The first meeting was the Tuesday lunch on 23 January. Discussions focused on where the Pueblo was when captured and what the United States could do about it. Inasmuch as it was too late to take the ship back, the group ran through several warlike options such as capturing a North Korean ship, hitting the North Koreans with U.S. forces, and augmenting U.S. forces in the Korean area. At this meeting the president articulated a feeling that came to dominate his thoughts - that the Soviet Union might be behind this and that it could be a "second front" designed to distract the U.S. from South Vietnam. There was no evidence to support this, just speculation. Later that day Johnson phoned the Soviet Union on the hotline to complain about it. He demanded Soviet intercession with North Korea, to which the Soviets replied that it was not their problem. Proof of Soviet involvement was lacking then and is still lacking today." It is possible that the author of this document used the phrase "Johnson phoned the Soviet Union on the hotline" as a figure of speech - further research underway with the author. Cold War: Reagan-Gorbachev phone. 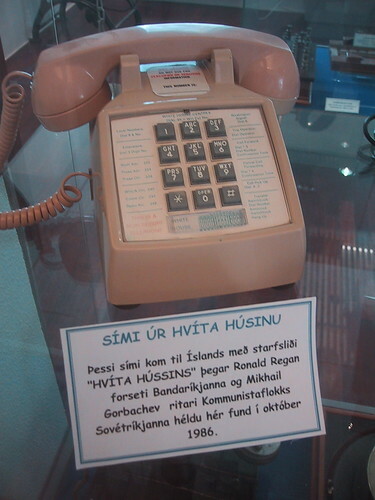 A visitor to the Reykjavik Telecommunications Museum took this photo of this phone which would have been used between Reagan and Gorbachev in October 1986 at the Reykjavik Summit in Iceland. This phone is very light red let us say. You can visit this website for the Reykjavik Telecommunications Museum. Special thanks to Shawn Caza for finding this "hotline phone". USSR and U.S. Hotline on Wikipedia. Interesting perpective from many contributors. U.S. Naval Cipher Phone. Wall Mount TA-840A/U by Naval Avionics Facility. Only scant information on this telephone on the web. U.S. Cipher Phone. SVP Model 1841346 by FEMCO. Limited information on this telephone on the web. British Air Ministry Phone. Although mostly black with a red handset, this Air Ministry phone had a "scramble" feature. Used during WW-II and into the 1950's likely. Limited information on this telephone on the web. 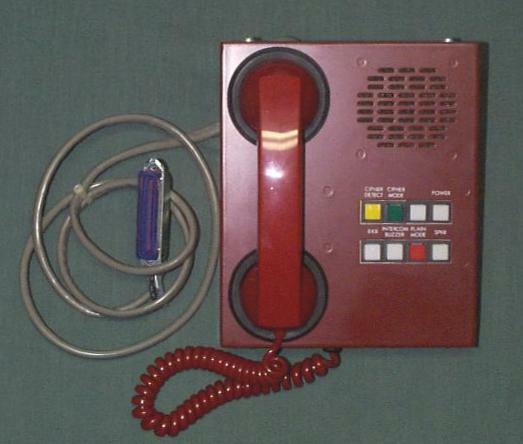 North American Pulse-Dial Red Phone. 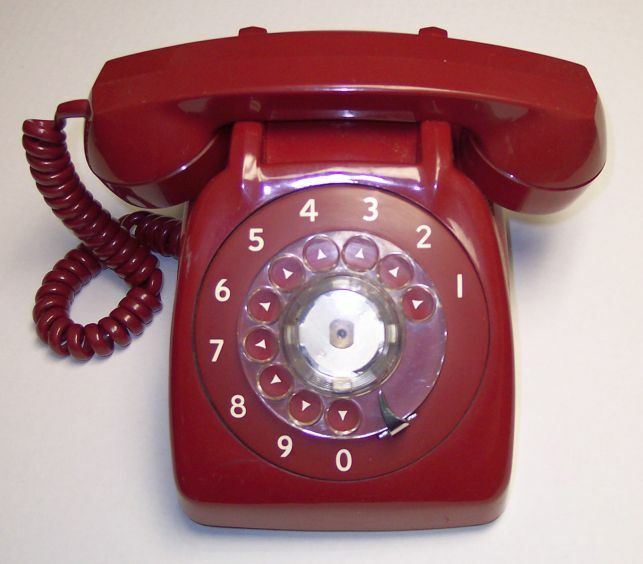 Although black and beige were the most popular colors for North American phones, some were available in red. I would have expected this phone to have been produced by Northern Electric but it has a logo with the letters AECD on the phone just below where the handset rests. 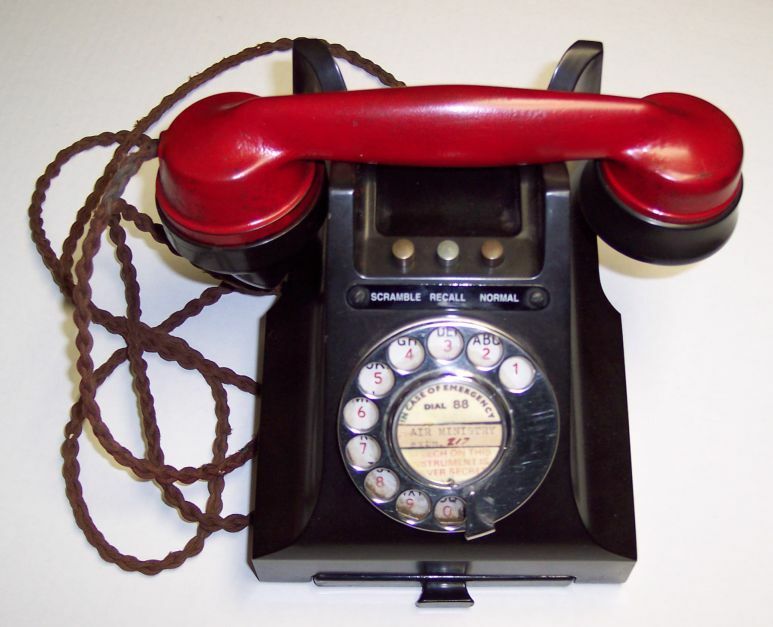 Many websites with information on the history of the commercial phones in North America. Here is one of them. 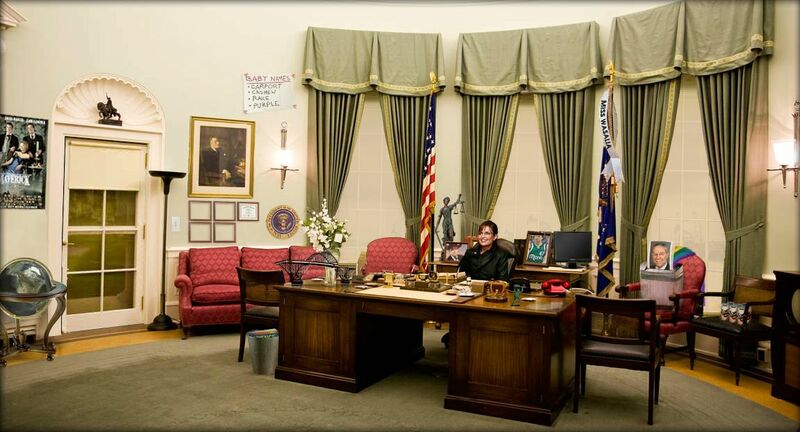 Palin's Oval Office Photo with Red Phone. Humourous flash player clip of Sarah Palin in oval office but with red phone on desk on her left side. Whatever you do once you are at this website, you can click on a number of interesting items in the photo but do NOT click on the red phone! No other websites to support this phone as it was likely a prop. 1984 Presidential Elections - Walter Mondale Red Phone Commercial. Red Phone Walter Mondale Commercial with what is no doubt a prop red phone. Other YouTube video clips available regarding the same commercial. Replica of White House/Kremlin Hotline Phone Vintage 1960's. Interesting website which states that the phone shown in the photo is a replica of the White House/Kremlin Hotline Phone in the 1960's. I have been unable to find any other photo from references (whether textbooks or websites) of this type of phone.